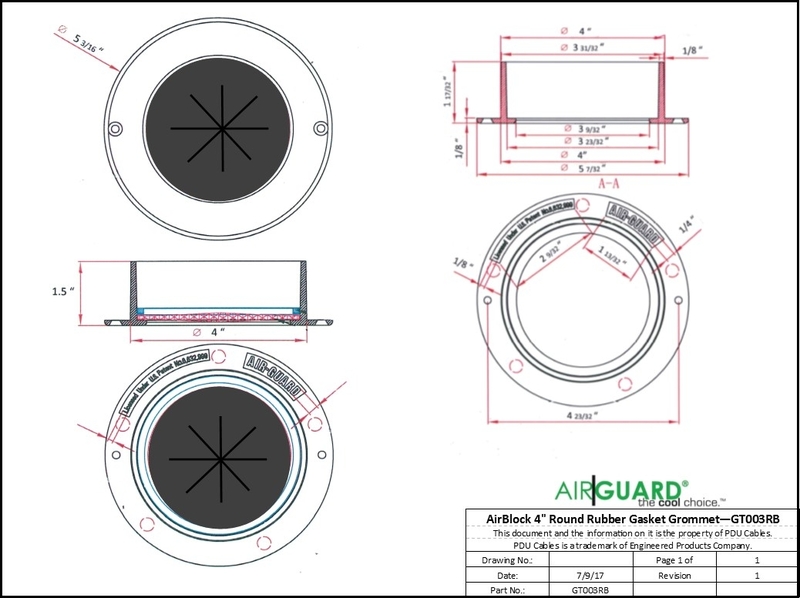 The AirBlock 4” Round EPDM Rubber Grommet is an easy to install rubber gasket grommet designed to interlock around and protect a single larger piece of conduit or a small bundle of power or low voltage wires using multiple layers of EPDM rubber to create an airtight seal around cables. The grommet is designed to provide an airtight seal for limiting airflow bypass in a pressurized underfloor plenum environment, while meeting both NEC 645.5 and NFPA 75 standards for protecting cables in floor openings from abrasion and minimizing debris from entering through cable openings. Constructed from the same UL 94 V-O flame rated ABS polycarbonate materials that make the AirGuard product line an industry leader. Perfect for data centers, under floor air distribution in raised floor office buildings, standard cable management for data and power access and even sealing smaller openings and penetrations in walls, and ceilings. • 2-1/2” (64mm) maximum cable size.